For this post, it's the shoulders. They took the longest and were quite possibly the toughest to sculpt for me to date. With the shape already decided, I took regular posterboard and cut the base shape out so I would have something to sculpt onto. 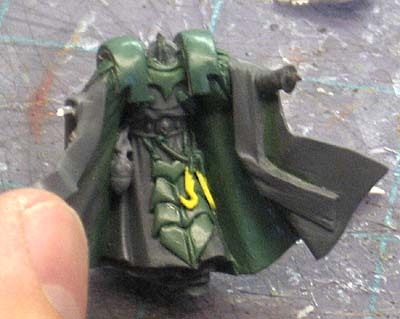 Once I had the right shape and size, I superglued them to the model and then coated the posterboard in superglue. The posterboard soaks it up and once dry, becomes just like plasticard and won't deteriorate when you sculpt on top of it. I bulked them up with greenstuff. 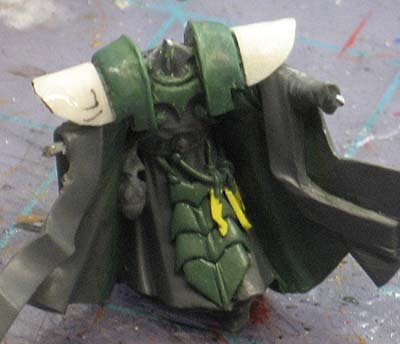 Once I had the inner shoulder pads done, I started work on the outer set. 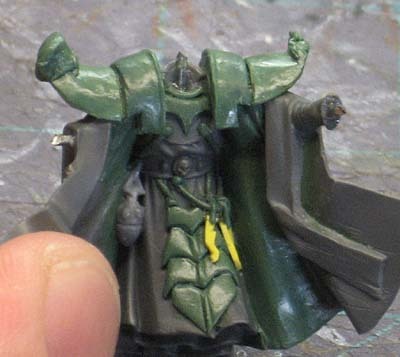 To get the ridge along the inside edge of the inner shoulderpad, I just needed to add a thin line of greenstuff and then shape it in place. The hardest part was getting the lip consistent along the whole surface and still match the other side. The process for the outer portions started the same as the inner. Bulking up the outer portions was the easy part, getting the up turned portion was the challenge of the whole model. Once I had them bulked out, I added small posterboard triangles (hidden by the blobs of greenstuff on the ends) for vertical support. Then it was a matter of sculpting the upturned portion as best I could. I left plenty of excess on each side knowing that I was going to spend a considerable amount of time trimming and shaving each one down to get them the correct shape, uniform in appearance and in proportion to each other. 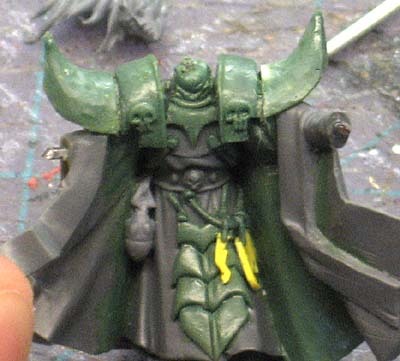 Once they were done, it was a matter of adding two small skulls to the shoulder pads, one on each side like the original drawing had. After that, I added a small blob for his neck, pressed the head in place to get snug fit and let it all cure. Of course that makes it sound like it was all done in one sitting. I think this took about 4 or 5 sittings to finish in reality. That looks so impressive! 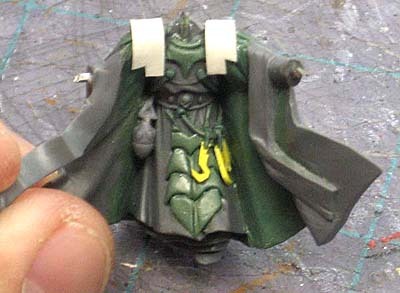 My greenstuff skills are seriously lacking. Can't wait to see the final piece. Wow.. This is great! I can say that your figure are awesome and very detailed... I love it! Anyway, thanks for sharing and I definitely visit here more often. after seeing the finished project in hand and with paint, I have to say that I totally forgot/ couldn't tell that you had so much green stuff work into it. A model with that much custom work that looks unconverted or believable is quite hard to pull off, and you have done a great job. The next step is a totally custom sculpted model. After looking at the greens at the booth at Games Day, I'd say you are ready to do your own from art concept to finished green sculpt. John: I don't know about a totally custom sculpt just yet. I'm able to reposition and use pieces to build what I want, but to start from scratch might still be out of reach right now. Maybe another year if I keep going.